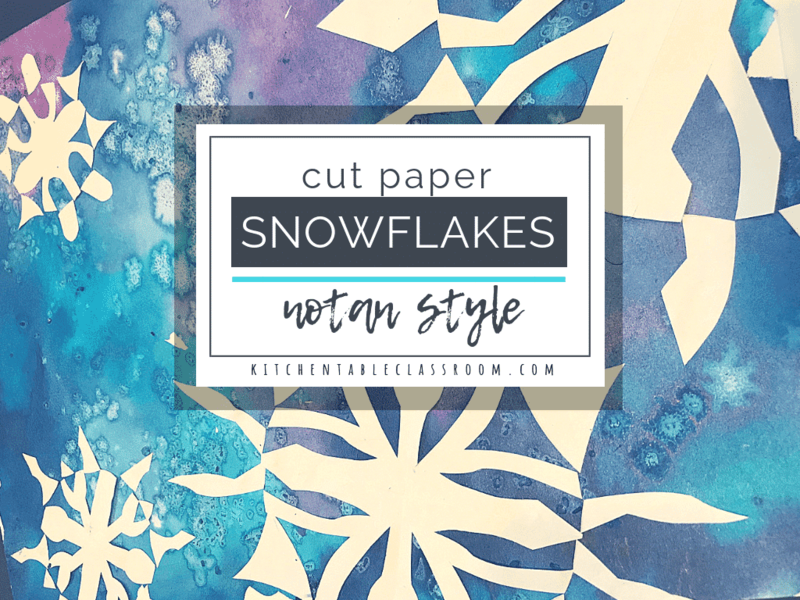 In our case we’re going to create cut paper snowflakes inspire by Japanese notan art that use all the paper, thereby balancing light and dark. Grab your compass and make a few circles in a variety of sizes on plain copy weight paper. Don’t get too tiny unless you’re planning on getting into teeny tiny details with a craft knife. Cut out your circles and fold into fourths. 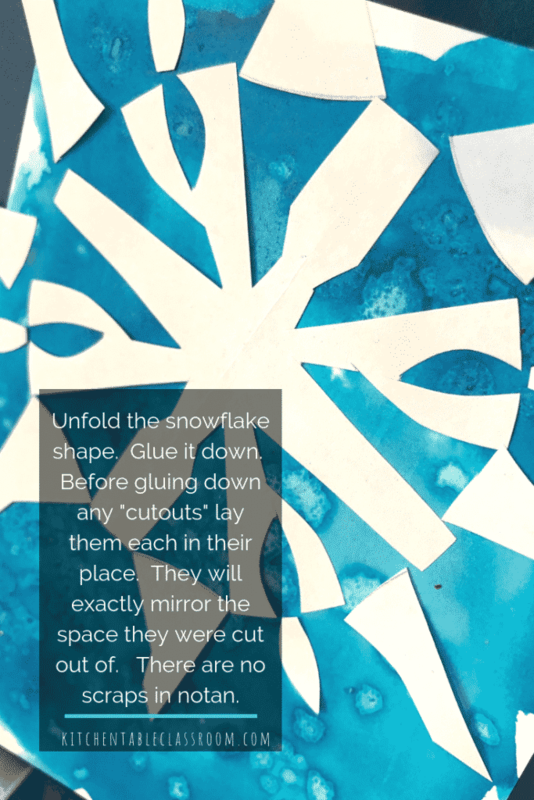 The idea is to cut two to three shapes out of each snowflake and use those cut out shapes as part of the design, balancing the positive and negative. I would recommend doing a “trial” run together with your kids before they get too serious. Here’s how. 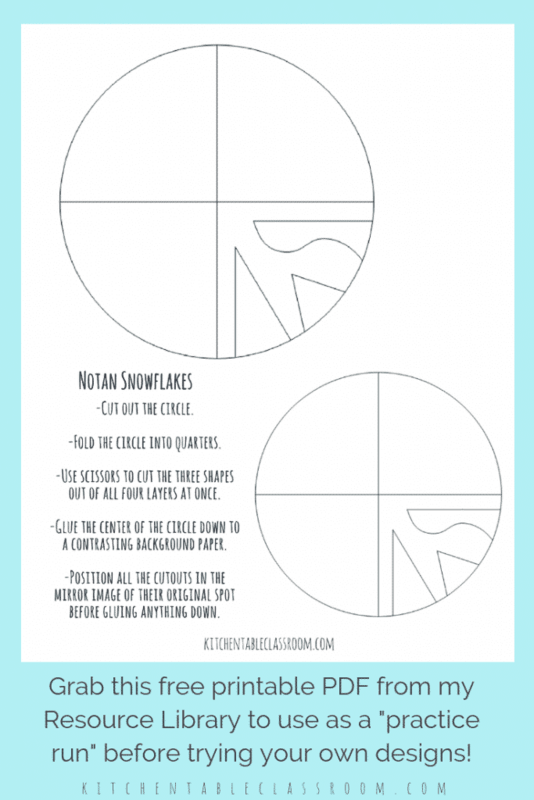 Want to grab these free printable notan art snowflake templates….. If you’re already a subscriber there’s no need to subscribe again. 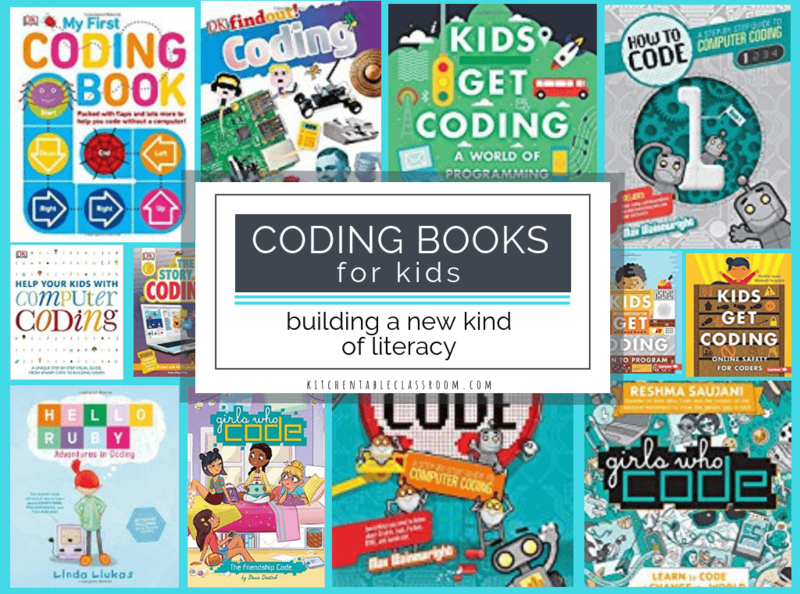 Just use your subscriber password to get into the Resource Library and download away. If you forgot your password just look at the bottom of any newsletter for a link to the Resource Library and the subscriber password! Start by cutting into the open, rounded edge and coming back to that same rounded edge. You want to cut out a shape in one nice cut, not shave it out little, by little. The piece that falls out will be used. It is easiest if each shape cut out of a single snowflake is distinct. Maybe one is very straight, one has a curve, and one shape is tiny. These are just suggestions. 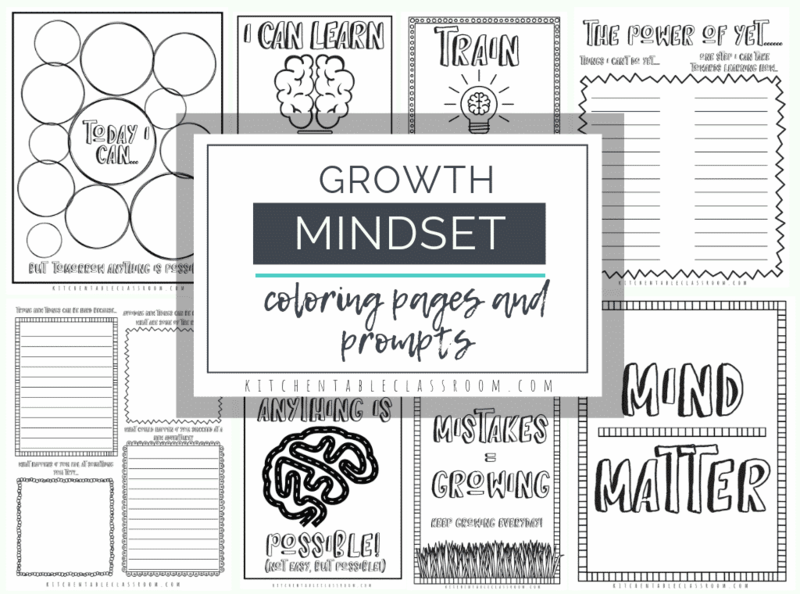 Start together till your kiddos get the hang of this! Cut only one snowflake at a time. Cutting more than one will be disastrous. Seriously. Don’t do it. You might notice that we’re working on background paper that has a life of it’s own! 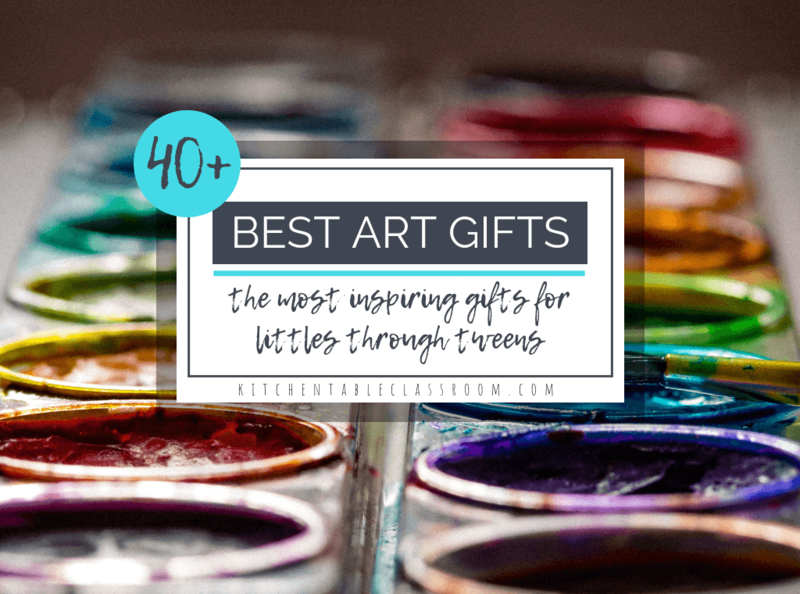 I won’t go into the details in this post but if you’re interested the background here is number two in this list of nine watercolor techniques perfect for kids! I love layering steps and techniques when working with even the youngest artists. It helps create a really interesting finished product while not requiring more than what they are developmentally able to do! Glue the larger center piece down so you have a reference point. We used a glue stick. It’s okay if the snowflake goes off the paper but be aware that the pieces will extend past the original circle shape. Before any more glue is used position all the small cut out pieces in their coordinating spots. These cutouts will mirror the spot from which they were cut. If it helps students can fit them back into the original circle, like a puzzle, then flip them out. 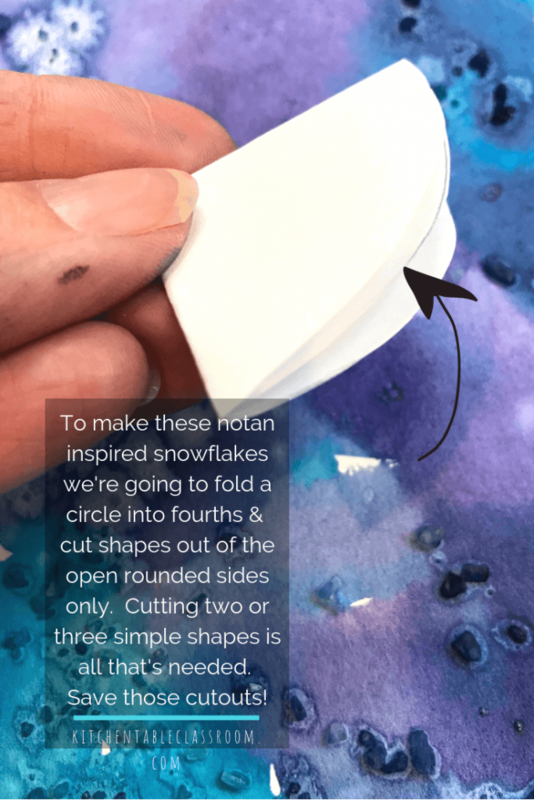 If pieces of your Japanese notan art inspired snowflake extend past the edge of your paper now is the time to trim them. 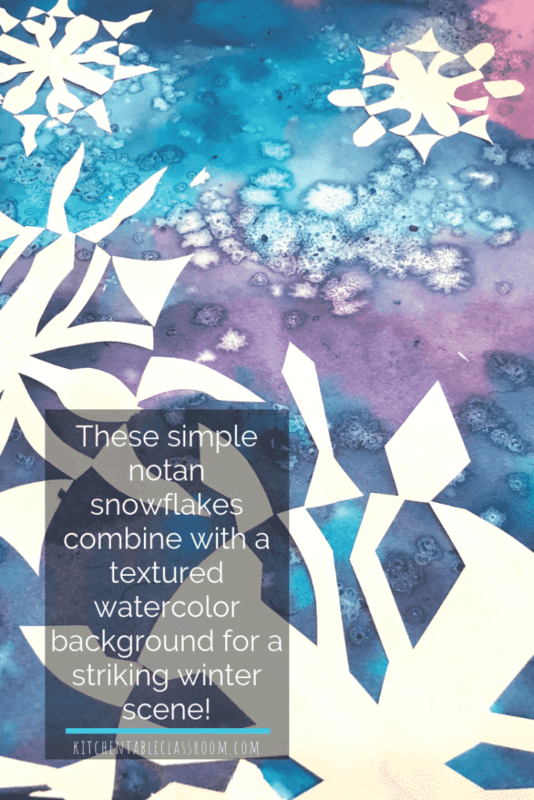 Whether you choose to do these notan art snowflakes on this textured watercolor paper (find out how here) or on a solid color the results will be striking. We used blank notecards to make some really beautiful notecards (above) that will last through Christmas and beyond! 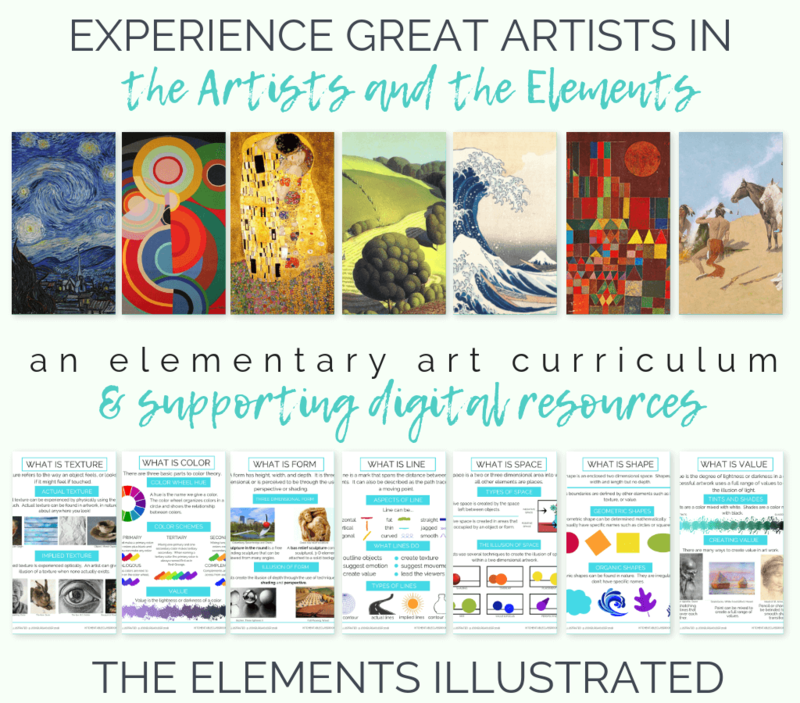 More projects inspired by Japanese notan art…. Mix Japanese notan cut paper art with the art of zentangle. 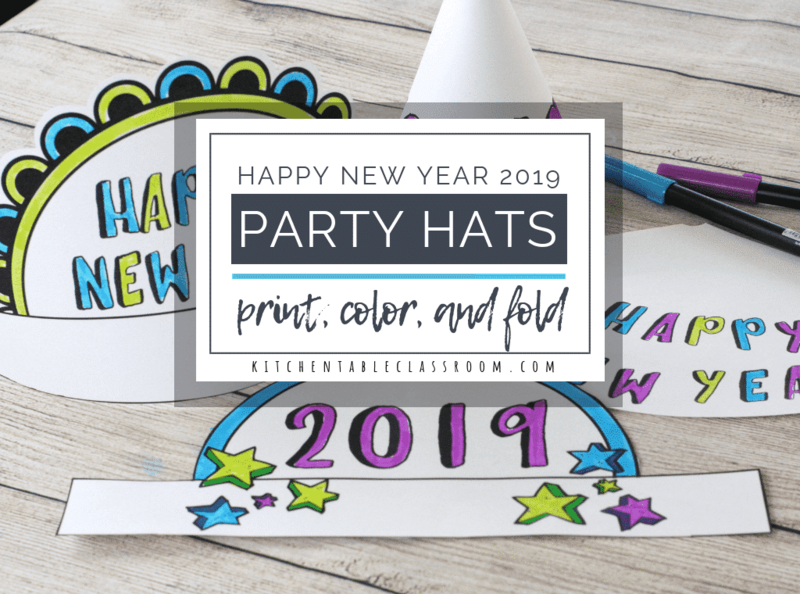 Turn simple leaf drawings into striking notan art cut paper images and incorporate the concepts of complementary colors! 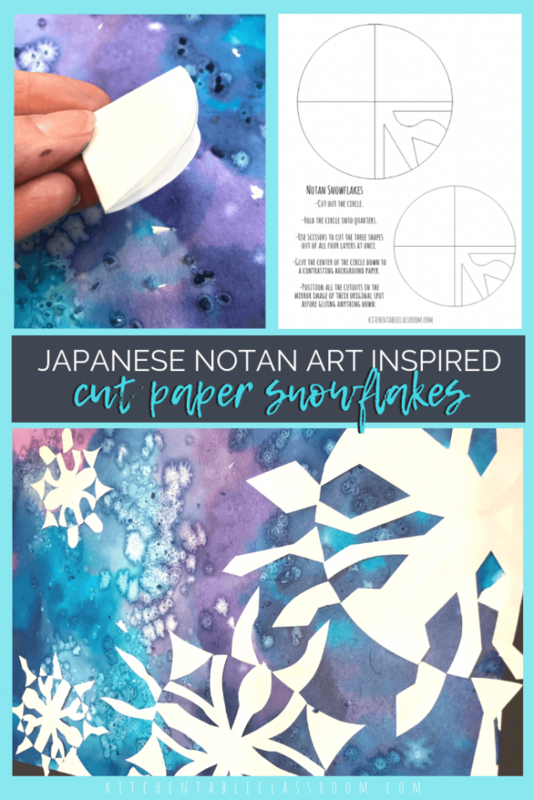 If you enjoyed these Japanese notan art inspired snowflakes please share them on your favorite social media channel. 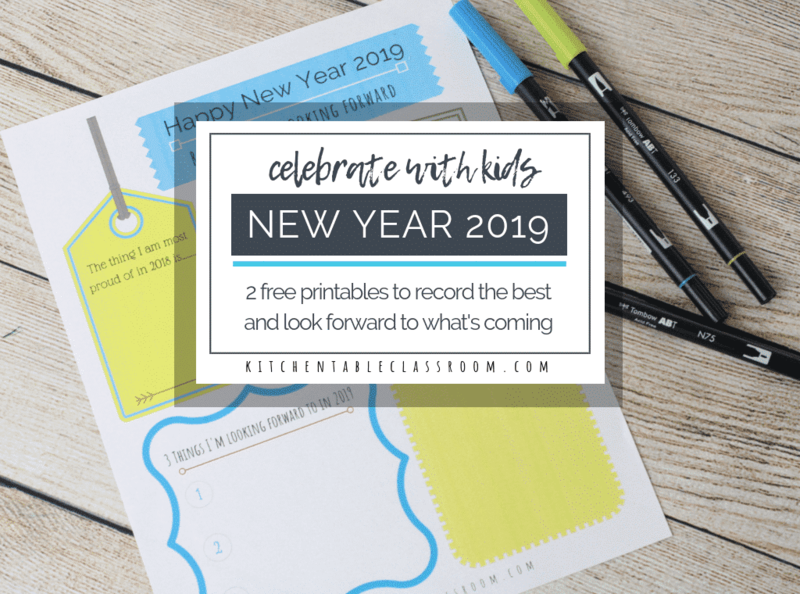 Every single share helps me to grow the Kitchen Table Classroom a bit and bring you more fun projects and free printables! I love your colored poster – The Principles of design! 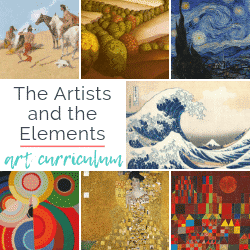 Do you have another poster like that for the Elements of Art?